Nickel chloride was excited in a high frequency discharge source and the band at 3664 Å was photographed at an inverse dispersion of 0.59 Å/mm on a two metre plane grating spectrograph. The rotational analysis was carried out and the molecular constants of the upper state are reported. The rotational isotopic shifts due to37Cl support the rotational analysis. The electronic transition involved is identified to beβ2Δ5/2 →X12Δ5/2. Proton and alpha particle spectra have been measured in the 12C+93Nb and 12C+58Ni reactions at E(12C)=40 and 50 MeV and in the 16O + 93Nb reaction at E(16O) =75 MeV. The spectra are compared with the statistical model calculations. The shapes of the calculated spectra are in agreement with experimental data except for the alpha spectrum in the 12C + 93Nb reaction at 40 MeV. The observed evaporation bump is at ∼2 MeV lower energy compared to the calculated one. This discrepancy could imply alpha particle emission from a deformed configuration before compound nucleus formation at this near Coulomb barrier beam energy. Many empirical evidences that point to the existence of preferred magic nucleon numbers for superdeformed (SD) shapes are presented in this paper. We use a simple premise based on the 4-parameter formula fitted using observed 𝛾-rays of SD bands. In particular, plots of 𝛾-ray energy ratios, nuclear softness parameter values and the number of SD bands for given 𝑁 and 𝑍 are used to pinpoint the magicity (𝑁, 𝑍 numbers) that are most favoured as the SD magic numbers. This analysis also leads to several new predictions on the occurrence of SD bands specially in neutron-rich nuclei. 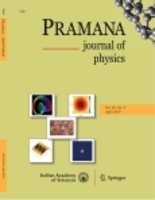 An overview of the experimental result on simultaneous measurement of pre-scission neutron, proton, 𝛼-particle and GDR 𝛾-ray multiplicities for the reaction 28Si+175Lu at 159 MeV using the BARC–TIFR Pelletron–LINAC accelerator facility is given. The data were analysed using deformation-dependent particle transmission coefficients, binding energies and level densities which are incorporated in the code JOANNE2 to extract fission time-scales and mean deformation of the saddle-to-scission emitter. The neutron, light charged particle and GDR 𝛾-ray multiplicity data could be explained consistently. The emission of neutrons seems to be favoured towards larger deformation as compared to charged particles. The pre-saddle time-scale is deduced as (0–2) × 10−21 s whereas the saddle-to-scission time-scale is (36–39) × 10−21 s. The total fission time-scale is deduced as (36–41) × 10−21 s.
Analytical performance of six different spectrum normalization techniques, namelyinternal normalization, normalization with total light, normalization with background along with their three-point smoothing methods were studied using LIBS for quantification of Cr, Mn and Ni in stainless steel. Optimization of the number of laser shots per spectrum was carried out to obtain the best analytical results. Internal normalization technique model was used for selecting the bestemission lines having sufficient intensity and spectral purity for Cr, Mn and Ni for comparison of different normalization techniques. For detailed evaluation of these normalization techniques, under optimized experimental conditions, three statistical parameters i.e., standard error of prediction, relative standard deviation and average bias, were compared for these techniques using theselected emission lines. Results show that the internal normalization technique produces the best analytical results followed by total light normalization. The smoothing of the raw spectra reduces the random error and produces better analytical results provided the peak under study has sufficient $(\ge 7)$ number of pixels. A semiclassical (SC) approach is proposed to calculate the $B(M1)$ transition rates in the band-crossing region of two magnetic rotational (MR) bands. In the present work, a geometry is suggested for the shear blades to govern its behaviour during the band-crossing. In the crossing region, gradual alignment of two nucleons is responsible for the crossing behaviour and it must give a quantised resultant angular momentum. As an example, it is successfully implemented for the MR bands in the mass $A = 110$ and $A = 200$ regions. A good agreement of the present semiclassical calculations with the experimental values is presented and furthermore, it is seen that the present proposal is also helpful to see the core contribution in the MR phenomenon.